The C160B Cross Strap Patio Chaise Lounge is the basket-weave version of our best-selling C160. 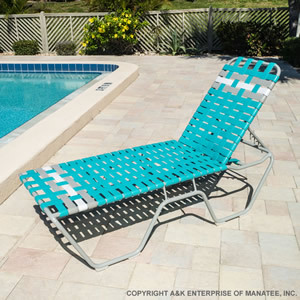 The C160B Cross Strap Patio Chaise Lounge has a high 16 inch seat height, the added support of woven 2 inch vinyl straps, a powder-coated aluminum frame, support bracing, an adjustable headrest, and it can be customized in any color combination! Perfect for commercial or residential use.